An enterprise with 170 years of history entered Ronggui in Shunde. 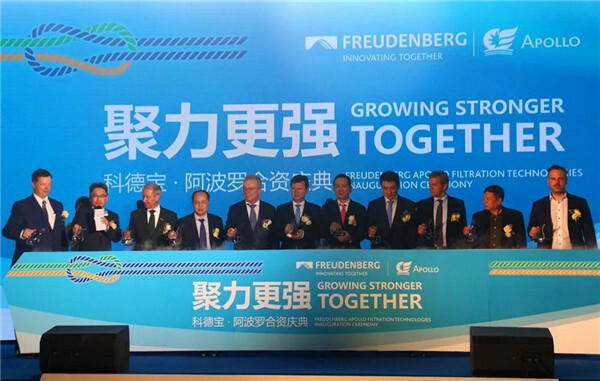 On April 9, the Freudenberg Apollo Filtration Technologies Inanuguration Ceremony was held. The joint venture co-built by Freudenberg Filtration Group and Apollo Group on the basis of the former Apollo Environmental Equipment Co Ltd in Shunde officially came into operation, opening a new chapter in the development of Shunde’s environmental protection industry. Tan Ping, Deputy mayor of Foshan, said, "We sincerely welcome the 100-year-old international well-known enterprise to invest in Foshan to drive the development of regional environmental protection industry, and to provide better air and water filtering products for consumers in China and even the whole world." In recent years, Foshan takes intelligent manufacturing, environmental protection and energy conservation as its main direction, and it has established a modern industrial system with strong base of traditional competitive industries and rapid development of emerging industries, continuously improving the innovation ability and the level of industrial cooperation. Tan Ping also hoped that the joint venture could seize the opportunity of Guangdong-Hong Kong-Macao Greater Bay Area and inject new energy for the development of environmental protection industry in Foshan. Foshan will fully support the development of enterprises as always and continue to optimize the business environment. Shunde Apollo Environmental Equipment Co. Ltd was founded in 2000 and it focuses on air and water filtration. In both 2017 and 2018, it was named the top 500 manufacturing company in Guangdong Province, with a sales volume reaching 750 million yuan in 2017. "As an innovative technology company, the Apollo Environmental Equipment Co. Ltd based in Ronggui, Shunde has a high standards in terms of quality, production process and safety. We hope to strengthen technical cooperation between the two sides to provide consumers with better innovative solutions for air and water filtration. " CEO of Freudenberg Filtration Group said.